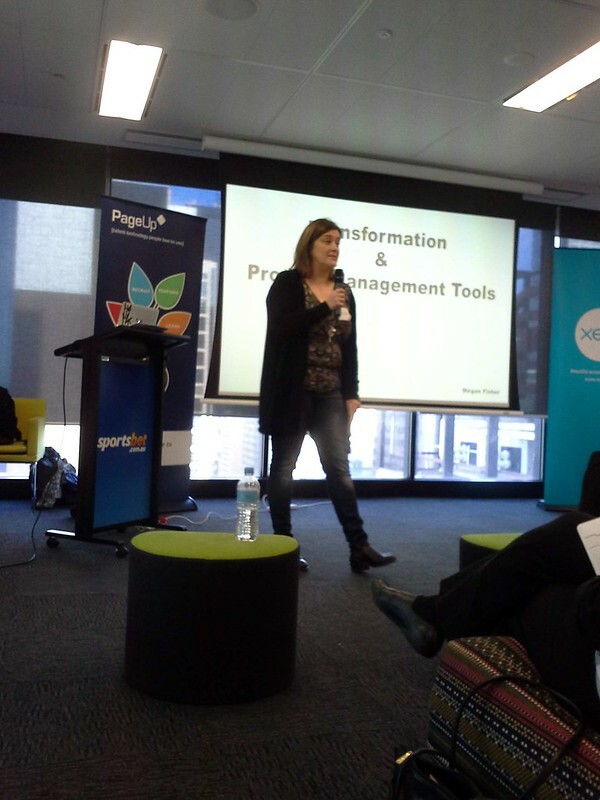 We started the day with a keynote from Megan Fisher from Sensis talking about her move from product management to corporate transformation. Megan wasn’t sure this role was for her when she was approached about it. She was product, not transformation! It’s only after she started getting into it that she realised transformation is just a big scale product management role. Megan presented the principles they have been using in their transformation project. These need to be appropriate to your business so develop your own list for your transformation or product management area. These agreed principles will help not only yourself guide what should end up on your roadmap or backlog, but will assist others in knowing what to focus on when you aren’t able to be in every discussion. In their case, along with test & learn, easy upgrade path, success milestones, and DIY focus, being able to simplify the product, process and technology were key. Have a sponsor that suits the change. You need someone who’s advocating the change. As a product manager you are always a change advocate, but you need support beyond just yourself. Your line manager might not be the right person for doing this. Make sure your stakeholders are involved early and involved in creating the requirements. They should also have accountability. While you should take the time to try to get it right – be aware that won’t always be the case – especially the first time. Building a test & learn approach from the beginning is a great way to approach this. Having a user group (internal or external) so you can talk with users is recommended. This might seem obvious when using agile practices in the product development world, however we often forget to plan time to go back and apply the learnings! If every iteration, next release plan is booked up before you’ve gotten feedback from the previous release then you aren’t really using a test and learn approach. [pullquote]Enjoy the transformation. Don’t run away because as a product person, this is where you really get to learn[/pullquote]. Understand when your company is comfortable with making decisions – including how much analysis is needed and how much discussion is required. Understanding how to make better decisions is also something to consider and that can include who needs to be involved as well as how to get the information out there that a decision has been made (Yammer? Forums?). Showcases are great for many reasons – they show what you already delivered, they create buy-in & engagement and help everyone be transparent with both mistakes and success. Showcases can also help people get accustomed to change. Megan found this was a great way of getting involvement. Their showcases involved up to 100 people for 3-5 hours. They would start in a big group & then have smaller break out sessions. Remember – we product people can see the future for our product but not everyone can. Some of our audience isn’t used to looking into the future so showcases can help them begin to see & make adjustments. In Megan’s case the showcase would start with an intro to the whole forum & then breakout into small groups. The key strategy in creating engagement was to get the business owner stream leads and the future users of the new functionality to do the talking. Not just the “product” people. These smaller sessions were no more than 30m for each topic demo and no more than 20 people in the group so that people could see and felt able to ask questions. Division btwn decision makers and those providing info. Comittee decision never good. Understand the escalation path.